These luxurious designer earrings, by Emis Beros, were made with rich, peacock blue Persian turquoise and dazzling diamonds. 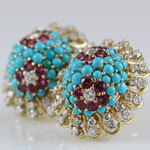 These stunning earrings have two large oval shaped blue turquoise stones. 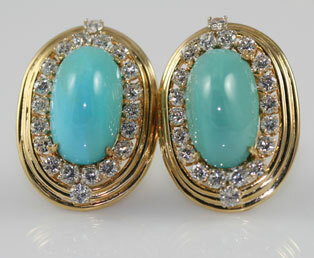 These turquoise cabochons are embellished with approximately 4 carats of diamonds. These white, dazzling diamonds compliment the beauty of these large turquoise cabochons. These estate designer earrings are crafted with exceptional quality and design in 18kt (750) yellow gold. Emis Beros began her fine jewelry designing career working for Mr. Harry Winston, the world famous jeweler. Several years later, in 1971, Mrs. Beros moved to Palm Beach, Florida where she continued to design exceptional fine jewelry. We are pleased to announce that photographs of these Persian turquoise and diamond ear clips may be seen in the 2010 released book by Joe Dan Lowry and Joe P. Lowry. These fine estate jewelry Persian Turquoise earrings may be viewed in Lowry's book - Turquoise, The World Story of a Fascinating Gemstone on page 50. Measures: H1 1/4 inch x W5/8 inch x D5/8 inch.